Children are enthused and motivated through exposure to a rich, and cohesive curriculum that facilitates their mastery of core skills across all learning experiences along with opportunities for ownership and self-directed learning. During their time at Hazeldown, they will have developed key skills necessary for future success. All Children will experience excellent teaching and learning which engages and stimulates them to think deeply, make links and ask questions. They will be stretched to explore and engage in open-ended investigation. 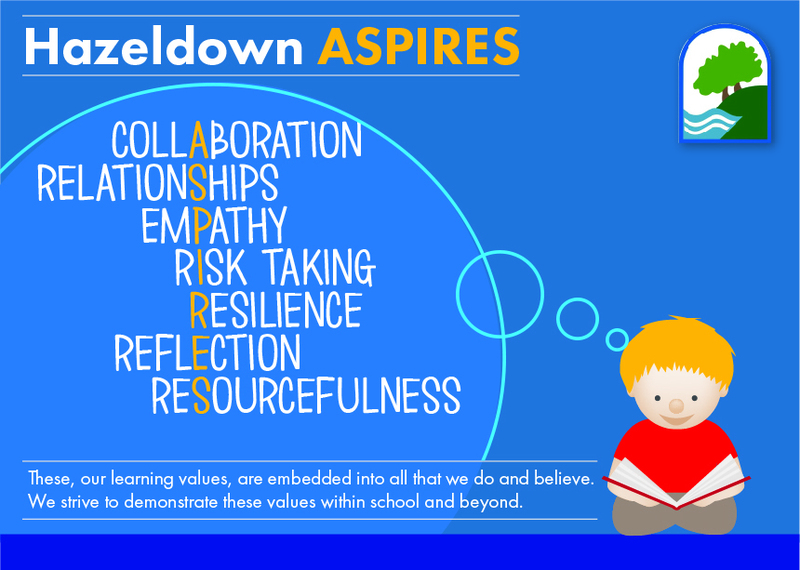 Hazeldown pupils’ talents and strengths are nurtured and all are supported and challenged to do their very best, with a large proportion surpassing age-related expectations in many aspects. Every child knows their own targets and can work independently on improving the learning. Parents and carers will be engaged in their children’s learning and with the school and are often invited in to join in in learning days and workshops. Parents and carers will have confidence and feel the school is meeting their child’s needs well. We believe that every child is a special individual and has a right to achieve personal success. We choose to learn together and from each other within trusting relationships, valuing everybody’s ideas.